A lot of talk about literature and culture is knee-jerk. From grad schools to websites, we've learned to take an almost hostile view toward items of popular culture, especially if the cultural product is American and middle-brow (and, I would argue, feminine). We think we have a superior view of a book or movie and can see (unlike the masses) how reactionary it really is. 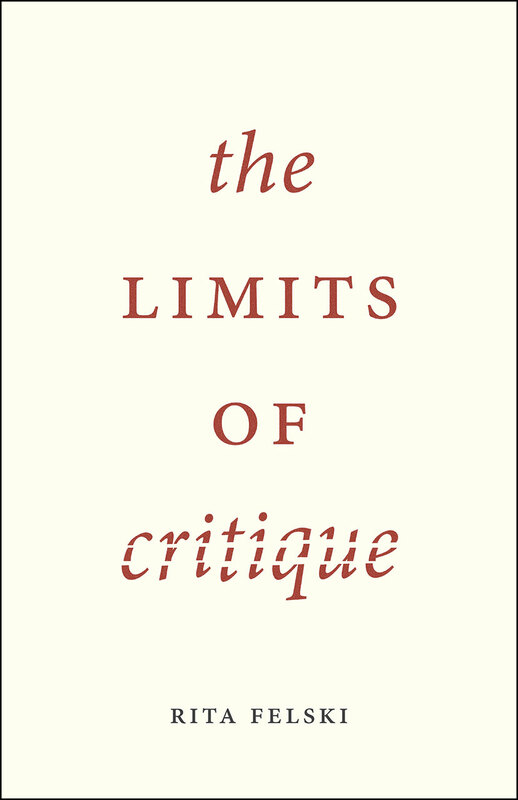 This viewpoint is the foundation of critique. It is the approach that sees art as disguised ideological messages or conundrums that even the author is likely to be unaware of. Reading becomes an exercise in unpacking the harmful dominant messages that the seemingly innocent text is foisting on us. There's a lot of merit to that approach. As a feminist critic myself, I do critique all the time. And I still remember with admiration one of the first pieces of critique I read, Terry Eagleton's analysis of The Mill on the Floss. But it's become a really unthinking and reflexive mindset—horribly superficial and self-satisfied. 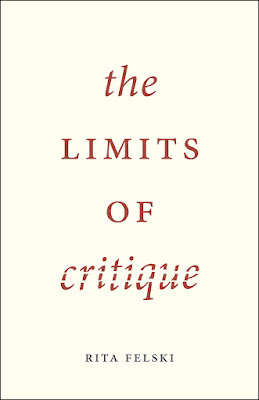 So it was with great pleasure that I read Rita Felski's The Limits of Critique, which takes apart pretty thoroughly critique's death grip on our critical faculties. Felski's argumentation is too varied to convey here, but to give a taste of it: She discusses Eve Sedgwick, the queer theorist who has begun to question the hegemony of critique: "Sedgwick wonders at the ease with which suspicious reading has settled into a mandatory method rather than one approach among others. Increasingly prescriptive as well as excruciatingly predictable, its effects can be stultifying, pushing all thought down predetermined paths." "Pushing all thought down predetermined paths" says it well. How many people's response to, say, Twilight is immediately (and predictably and stultifyingly), "It dresses up stalking as romance." Well, it really doesn't, but of all the narratives we've been taught to be suspicious of, romantic ones top the list. Romantic narrative is nearly always interpreted as being bad for women, despite the fact that women seem to love it (a love that is then framed as stupidity or naivete or lack of self-esteem). This kind of interpretation amounts to scanning the horizon for key words or key situations that the critic then gloms onto and pastes a label on. What it's missing is thoughtfulness and an attention to evidence. Felski's book is academic (which means, among other things, it's way too long and jargony), but it's a good documentation of our efforts to break through the cage of critique and interact more freely—and intelligently—with art.